This universe, known by Yivo, an exo-universal being, as Universe Γ (gamma) and briefly by the crew of Planet Express as Universe A (to avoid confusion with universe 1) is the primary location of all that is, and the entire sum of all history. The universe was created in the Big Bang, and will end into another Big Bang creating a universe identical to the previous one. This will happen in the year 10 E 40. There exist other universes, however, which are all described in comparison to this universe, ranging from subtle differences to the extreme. 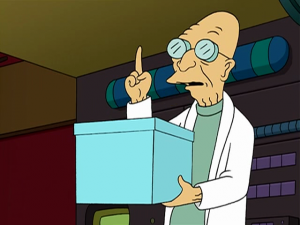 Technically, this universe appears in every episode/comic/film of Futurama, but this list includes appearances that are important to the nature of the universe or the universe itself being referenced in particular way (primarily in speech). This page was last edited on 29 October 2015, at 22:02.